reminiscing on the harsh past. The video stylishly portrays the theme of the single by depicting the reggae star as a boxer, who is staged in the ring to battle with his negative past self. The star is victorious and the sweet melodic chorus is sung over & over again, "now I can taste victory". The video is currently garnering exposure from numerous media outlets and most recently was picked up by MTV Iggy. MTV Iggy is a division of Viacom Media Networks, focused on bringing cutting -edge global music and pop culture to the U.S. "Taste Victory" video can be seen on MTV Iggy and has received quite a few hits since its post on the site several days ago. Directed by Jamaican music video specialist RD Studios, it is the artist himself who is credited with the visual concept. "I wanted to portray to those that live with self doubt, that personal achievement is often only held back by this negative internal struggle and that it must be overcome to fully flourish" said Nesbeth. On the subject of the video getting picked up by world famous station he continued "It is an honor to have my video apart of the brand MTV Iggy and among a diverse group of musicians. I see this as an opportunity receive exposure to a new audience and gain new fans". 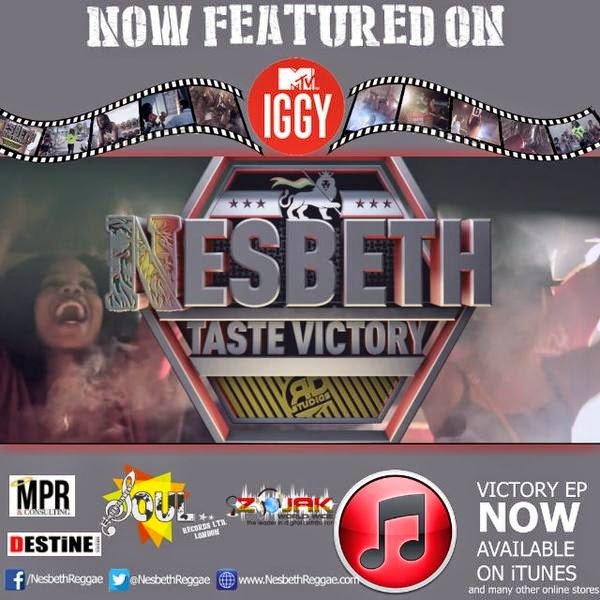 Nesbeth is currently promoting his EP "Victory", which has just received a stellar review from prominent website Reggaeville, and look forward to his upcoming performance on Rebel Salute.